Sometimes great birding days are not about all the birds you see. Some are great because of just one. I had spent the morning on Navarre Beach, walking the pier looking for sea turtles and dolphins, then making my way down the beach. A thunderstorm threatened, casing a dark shadow across the green waters of the Gulf, but rain never fell. The beach had a fair number of shorebirds, plus dozens of Least Terns scanning the surf for little bait fish and other prey. Nothing new or unexpected, but pleasant nonetheless. As I hopped in my car to head home, I pondered the Florida birds I had yet to see. Some I had never even come close to, like the Reddish Egret, but others I had almost seen. How does one almost see something? I am an odd duck sometimes, and I have strict rules for my own personal birding. I was about 90% sure I had seen a group of Gray Kingbirds at the Emerald Coast Visitor’s Center on Okaloosa Island. They were flitting around a palm tree, making calls I had never heard before. I was pretty positive that the slate color of their backs set them apart from their close relative, the Eastern Kingbird, and I was fairly certain their calls were distinct as well. But I didn’t have a camera or binoculars, so I couldn’t be 100% sure, and for my life birds, I have to be 100% sure. Since then, I have had fleeting glimpses of other birds that could have been Gray Kingbirds, but nothing definitive. They would migrate soon, and as I pulled out of the parking area at Navarre Beach I was musing about my chance of spotting the kingbird before winter descended. Life is funny sometimes. Less than 100 feet from the parking lot I suddenly pulled over, spying a very interesting bird on the power line. 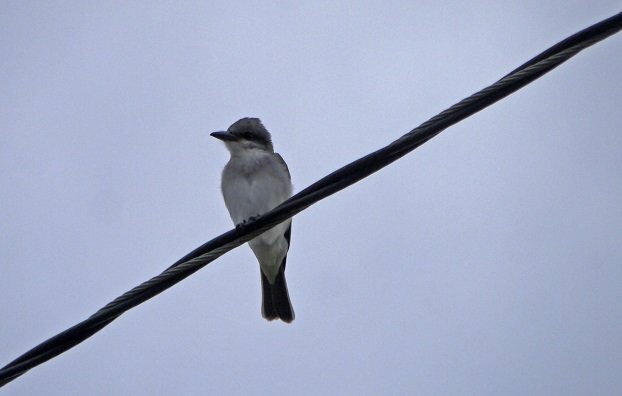 I couldn’t even believe it – there was a Gray Kingbird right there! I had my camera with me, and I quickly confirmed the field marks: overall gray color, lack of a white-tipped tail, pale belly. To underscore the ID, I took a recording of its call. It was a Gray Kingbird all right, appearing just moments after I wondered if I would ever see one. 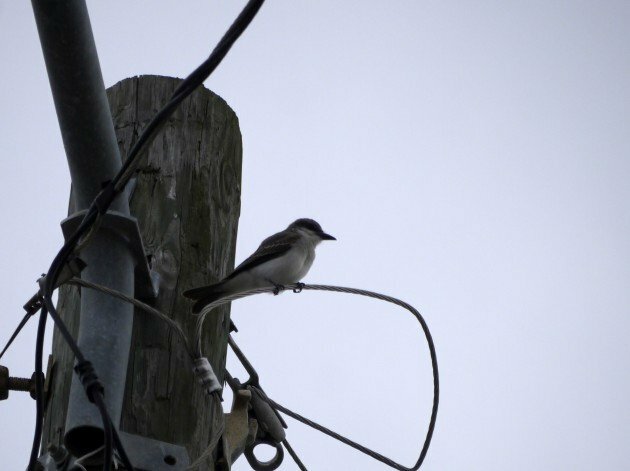 So though I had seen many other species that Saturday morning, my day – my weekend really – was made by a Gray Kingbird on a utility line.